While this scene looks like the mesmerising result of shaking up a festive snow globe, it is in fact the disturbing effect of one of the most powerful solar storms ever recorded. Over two weeks in October and November 2003 the Sun was unprecedentedly active, with giant sunspots – over 10 times the diameter of Earth – generating flares on an almost daily basis. Solar flares are classed according to the energy they release at X-ray wavelengths. There are five major categories: A, B, C, M and X, further divided into 10 subclasses. M1 flares are 10 times more powerful than C1, and X1 flares are 10 times more powerful than M1 flares, or 100 times more powerful than C1. Some of the flares witnessed in this two-week period were so powerful they broke right through the top of the X-class range, which is usually given as X10. A flare erupting on 4 November was estimated to have reached at least X28. The ESA/NASA Solar and Heliospheric Observatory (SOHO), launched in 1995 and still operating today, was monitoring the Sun’s stormy behaviour during this time. 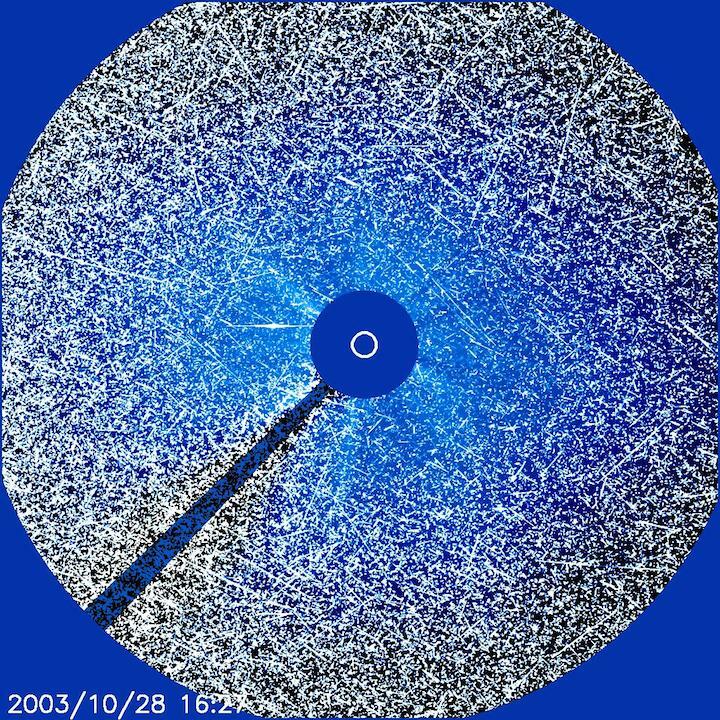 This image shows its detectors being completely swamped by high-energy protons that were accelerated to nearly the speed of light (300 000 km/s) in the X17 flare of 28 October 2003. When Earth is in the firing line of associated coronal mass ejections (CMEs), it can lead to beautiful and bright auroras in the atmosphere, giving unparalleled insight into the interaction of the Sun and Earth. CMEs can also cause serious disruption to radio communications, air traffic control and power grids. Although these powerful storms reveal the extremes of the Sun’s activity, fortunately for Earth, those on the scale of the 2003 events do not occur very often. The image was taken by SOHO’s LASCO C3 instrument. A special disc (indicated by the large blue circle) inside the instrument blocks the Sun (indicated by the inner white circle), so that details of the extended outer solar atmosphere can be observed.